If you find yourself with a possible bumble bee issue on hand, you may be wondering where to start. Generally these insects begin showing up in spring and can stick around until the first freeze, though many die sometimes before that. You may have several questions like do bumble bees sting? How can I protect myself from these pests? Is it safe to remove them without killing them? Below you will find the answers to your questions and more information regarding bumble bees. What does a bumble bee look like? Bumble bees are flying insects. These particular bees are yellow and black with a fuzzy body. The queen is bigger than most in the colony, and usually is able to be picked out easily. 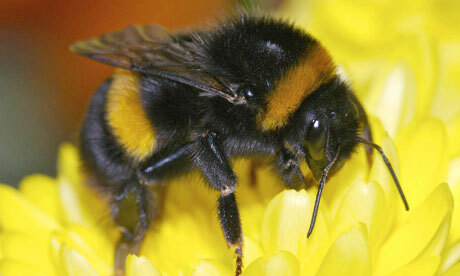 The female bumble bees (including the queen) have stingers and the males do not. Generally they will be spotted around flowers and flying in and out of their nests during peak times. What does a bumble bee do? Bumble bees are natural pollinators. They will buzz around from flower to flower while carrying pollen with them on their legs. Because they are incredibly valuable to nature, many states won’t allow you to kill them. These pests do not store or produce anything like their cousins the honey bees, but sometimes will bring nectar back to the nest to feed the worker bees. How does a bumble bee live? In early spring, the mated queen bee will re-emerge from the ground in search of a new nest. She will likely choose something like an abandoned mouse hole or another similar structure. Once the place is chosen, she will lay her eggs. They will then hatch in approximately a week and will become the first worker bees in the colony. At the height of the colony success, there can be up to 100 bees living inside of it at once. The number is usually closer to 60-80, but either way that is an impressive amount of bumble bees. The bees will die off as the season progresses and once the first freeze happens, all of them except the queen bee will be dead. She will hibernate for the winter and the process will begin again in the spring. The short answer is yes, but it is more complicated than that. The females are equipped with stingers and the males are not. Usually a bumble bee will not seek out and sting an unsuspecting person. If the nest is threatened, all bets are off when it comes to the bumble bees attacking. Because the stingers are not jagged, there can be multiple stings given out by one single bee. You must try to avoid being stung at all costs, especially if you are unsure if you are allergic or not. How can I get rid of bumble bees? You will need to check your local guidelines because they vary state by state regarding whether or not you can kill the bees or if you will have to relocated them. Below you will find suggestions on how to get rid of bumble bees that may be pestering you and your family. Scope out where the nest is during daylight hours. Observe where the activity is happening around dusk. Prepare yourself by purchasing pesticides at the local hardware store. Do your research about which products come recommended and how your pets or children may react to them. Wear protective clothing and attack the nest at night. The bees will be sleeping so the chances of retaliation are slim. Do it yourself with a homemade mixture. Follow the steps above but instead of buying pesticide, make your own. You will need dry cat food, boric acid, and grape jelly. This is not recommended if you have pets that go outdoors or if you have small children. You will mix the ingredients and form the mixture into balls. Scatter them outside of the nest overnight and wait for the bumble bees to carry them back into the nest. This will poison the entire colony within a few days and eliminate the issue. Spray. If the bumble bees have made a nest in the siding of your home or in an outdoor building, you will need to look for a product like Delta Dust. Once this is sprayed, the bees will die on contact. It is supposed to last for up to six months, though it may need to be sprayed again sooner. Once you know that all of the bumble bees have vacated the nest or died, you will need to remove the remaining part. Remove the nest and relocate it. This has to happen if your state laws require it. Bumble bees are sometimes protected because they are nature’s pollinators and are vital to the growth of flowers and such. If this is the case, you will need to take extreme precautions to ensure the bumble bees do not sting you. An exterminator may be a good idea to call for help you if you can afford it. If not, you will have to purchase something similar to a bird’s nest box and cover the colony at night. You must then seal all of the holes and relocate the colony to somewhere else similar to where you moved the nest from. How can I protect myself from bumble bees? If you are trying to avoid being stung, you must wear protective clothing. Thick layers will do the trick, but make sure you aren’t going into combat the bees with any skin exposed at all. Wear gloves when handling the nest. Work gloves are preferable in this case. It is recommended that you also have your face covered. Face and neck stings are the worst. Because bumble bees will sting, it is important you are always cautious. Once you remove the bees or kill them, you will have to be proactive in ensuring they will not return and new eggs do not hatch. Cover the entrance hole to the colony with dirt after applying pesticides. This will keep bumble bees who had not yet returned to the nest from re-entering and any of the ones that escaped the pesticides from leaving. You should also seal any other holes you find when looking through your garden or yard. If you are dealing with a colony that was in the siding of your home or outdoor building, you will need to have things repaired. Even if you have gotten rid of the nest, another queen bee may want to use the same spot. Repair the siding or cover up the entrance with the best of your ability. Any outdoor building repairs can be handled at your discretion. Remember though, if one queen bee found the place suitable, another one will as well. What should I do if I get stung? If you aren’t sure about allergies, you will need to be extremely careful. Bumble bees can sting more than once, and it can hurt. Face and neck stings are incredibly painful. You may be advised to use an antihistamine after being stung. There may be a little bit of swelling as well. If you happen to be allergic, you will know immediately and need to seek medical attention. Avoiding getting yourself into a panic is key, especially if the entire nest of bumble bees are attacking you. Being calm isn’t easy, but is completely necessary in situations like this. By keeping yourself informed, you can prevent the worst from happening. You will no longer be asking yourself do bumble bees sting, and you will be able to prevent it from happening. Remember to check your local guidelines about bumble bees and do the right thing when trying to remove them from your presence. While these pests aren’t usually aggressive, they can be. Following the proper protocol will make this experience less painful and will ensure your issue is addressed thoroughly.